A residential project J. Barker Landscaping Company installed in Lakewood, a community west of Cleveland, Ohio is certainly a project that keeps on giving – both to the owners and their landscape team. 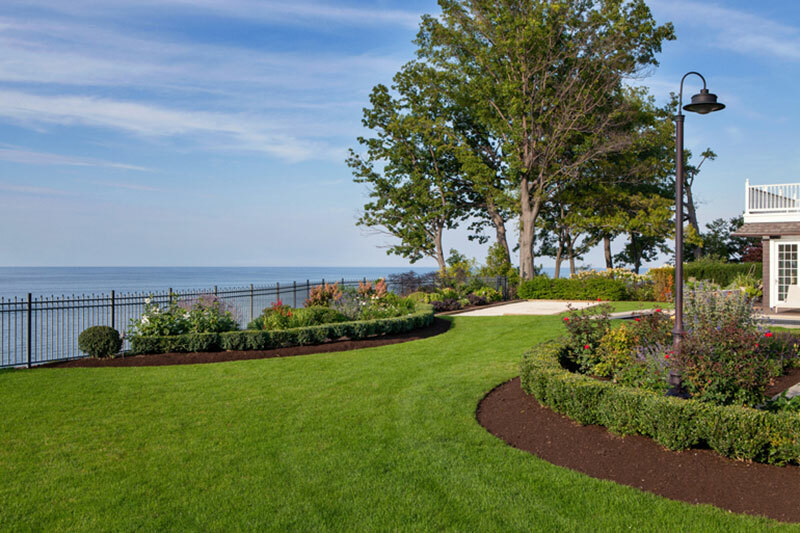 The property, which includes 120 feet of lakefront footage, recently won a merit award for Residential Landscape Maintenance from the Ohio Nursery and Landscape Association, and no wonder. Designed to achieve four-season interest, it requires two-to-three days of maintenance weekly from a crew of two. In its own way, the 2015 job was initially a gift to J. Barker, as well. Brandon Barker, the company’s commercial operations manager, explains the firm got the job based on the recommendation of one of the property’s neighbors. The job called for a renovation of the entire landscape that appealed to the homeowner’s passion for European design. For that reason, the project manager incorporated a mix of evergreen trees, boxwood hedges and broadleaf shrubs, as well as ornamental trees, hydrangeas, roses, perennials, annuals, and more than 900 tulip bulbs imported from Holland. Nor is that the only thing unique to the property. The owners also requested – and J. Barker installed – a pétanque court. Barker explains the French bowling game is similar to bocce. Although his company often does perform hardscape work, in this case Barker says the pétanque court was meant to complement the existing hardscape on the property, which includes a pool, sandstone decking and a sandstone patio. The irrigation system for the property includes 104 pop-up spray heads, 30 gearheads and 15 zoned valves. In addition, the maintenance crew often does hand-watering for plants that need special attention including a trough garden for herbs, peppers, tomatoes and similar vegetables. The lighting is an LED system that features accent lighting to showcase some of the plantings. Because the site centered on an existing home, Barker says there really wasn’t a lot of grading involved in the project, with much of that centering on preparation for installing the pétanque court and planting an entire new lawn. Work began at the site late in 2014, and soon ran up against what Barker calls the biggest challenge of the project. After starting the landscape work, the clients decided to have the existing garage razed and replaced with an enlarged five-car garage and pool house that required some redesign and relocation of plants to accommodate the new structure. However, the overall success of the job has given J. Barker Landscaping plenty to be proud of, and plays into the company’s overall philosophy, he says. Plus, he says the $100,000+ project has done a lot to develop additional business for the company in the neighborhood. For him, however, it’s all about the plantings. The company definitely plans to enter the landscape in other competitions, Barker says. In the meantime, it’s gone a long way toward developing better teamwork between the design side of the business and the installers, he says, at least in part because of the project manager’s diligence.